We have talked about creativity in education as a recurring theme for many years. So, what’s so different about Apple’s latest offering? The “Everyone Can Create” series of iBooks promise to change how we look at and implement, creativity in the classroom. They are a free resource, so definitely worth adding to your iBooks collection and they provide what is, in essence, a free scheme of work for you to use with your class. Maybe the title should have been “Everyone Can (have a free scheme of work to help them) Create”. I am a fan of embedding technology into all aspects of the curriculum, but in most cases, this is easy to say and difficult to do. These guides remove all the hard work in trying to do this. They give step-by-step lesson ideas, embedding technology into the curriculum which culminates in a finished product. With no previous experience of any of the topics covered, you’ll be able to deliver a great half-term's worth of content. You don’t need to know all the answers, you just need to take a creative chance on doing something different. 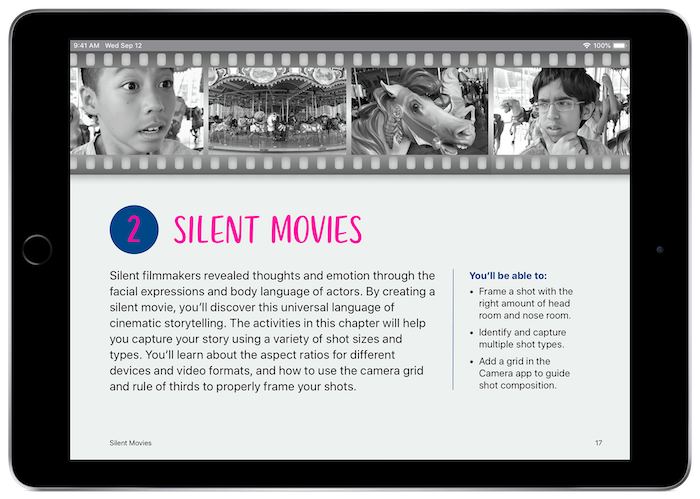 These iBooks open up a world of possibilities, that can be used throughout the curriculum. Give it a go! So what have we got in the series? 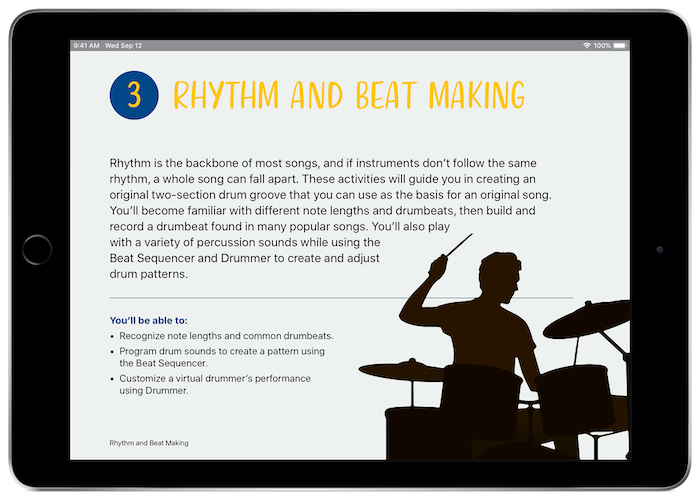 Each book has a step-by-step guide on how to use Apple, or other free apps to deliver a creative curriculum. There are the obvious direct links with the Art and Music curriculum in the books and ‘Everyone Can Create Video’ expands out to many other subject areas. So you might write a poem in a literacy lesson, then record it in GarageBand and add your own soundtrack to enhance the meaning of the poem. If you don’t think you’re musical, let Justin Timberlake lead you through a masterclass in using GarageBand (to name but one of the activities). One thing to remember, this is not in addition to your curriculum, it is the curriculum! You don’t even need to find extra time to fit this in, you can embed it into your usual planning. The Everyone Can Create series saves you from having to plan a lesson, there are even marking resources available to download. Everything you need for a lesson is there, ready to use and you can easily amend the activities to fit in with your existing plans. 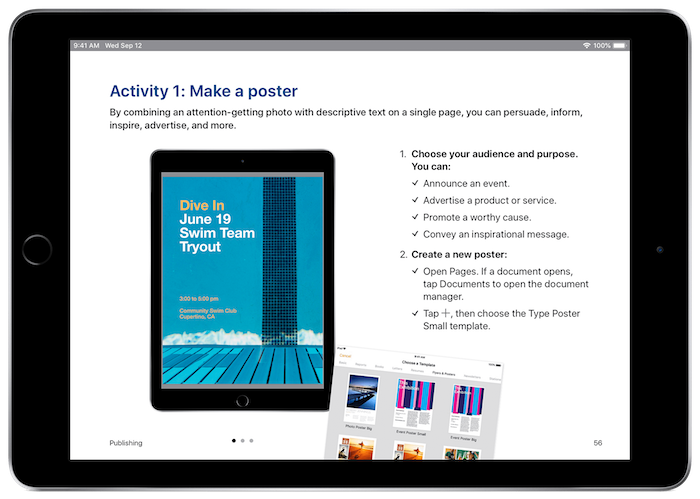 The Teacher Guide is written from a teachers perspective and explains how to use each iBook in detail. At the end of each section, there are “Integration Ideas” that show you where the activities fit into lessons with cross-curricular links. There are so many good ideas here I can only encourage you to download the Teachers Guide and give it 10 minutes of your time. I think you’ll find it worth your while. Drawing is a substantial part of the Art curriculum. We all draw or doodle, as a way of expressing ourselves and communicating ideas. 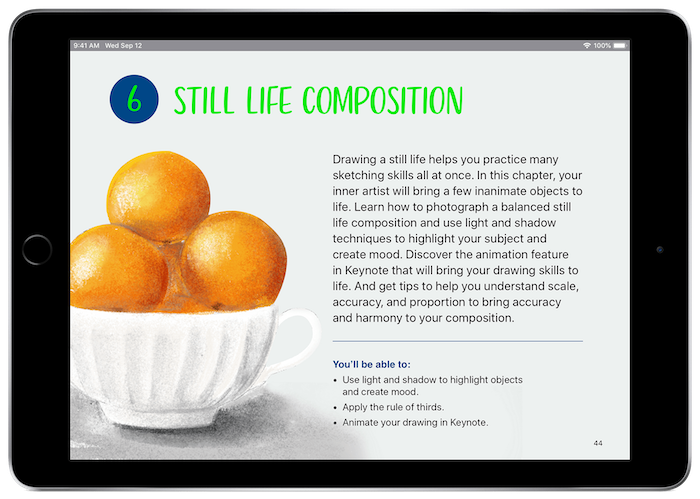 Once you’ve read the Teacher Guide and downloaded the Drawing iBook to the iPads, you and your class can go on an artistic journey, learning how to use a range of free apps with tips and techniques to produce your own artwork with no extra cost. The list of activities included is a thorough set of lessons that would happily slot right in to your art scheme. By contextualising the activities, it brings real-world experiences to pupils. Although we might not all think of ourselves as artists, these step-by-step guides (and a bit of practice) will improve skills and confidence immensely. There is also a quick guide on how to use Sketches School, a free app that is used throughout the activity. We all like a bit of word art, bubble lettering for displays etc. Here is a chance for students to perfect those skills and maybe develop a few more styles to add to their repertoire. Making use of the simple tools in Sketches School app, students create their own emoji. Students are steadily led through a whole range of mark making activities (the sort of thing you do in your school sketchbooks) and are all stored into a personal, digital sketchbook. The tips and tricks start here, with an introduction to 2D shapes and how they can help to draw many common objects by breaking them down into their basic shapes. Once this skill has been mastered, the sketches can be used to produce Sketch Notes (mind maps in old money) to demonstrate thinking and ideas. These skills can spill over in to many of the lessons you deliver. Moving on from 2D shapes, we are introduced to 3D shapes and the use of light and shade to make our sketches more lifelike. Different methods of shading are demonstrated and pupils are invited to make a book of different techniques. Using all the skills they have developed during this activity, they then practice by drawing a robot, followed by a sketch of their own. This would be a great activity to build up to, before a field trip. Students are encouraged to use their natural surroundings and look at the features and aspects of the environment that they find interesting. They are taught about depth and perspective, how to use the smudge tool and understand how to sketch from different viewpoints e.g. bird's eye view or eye level and what that can bring to a piece. I remember being taught this at school. Using the iPad however, means I can have many more attempts to get it right without rubbing a hole through my paper with an eraser! For many pupils (and teachers), this lesson on the basics of sketching a face will change their understanding of drawing immediately. They’ll map the face to understand proportion, use tracing techniques to improve accuracy and explore realistic, cartoon and abstract drawing styles. The Sketches School app also features a tracing element, which can give welcome support to those less confident. This section builds on more ways to shade and texture objects, using light and shadow to highlight objects and add mood. Simple objects (traditionally a bowl of fruit or a disused brass instrument in my experience) make interesting arrangements to draw. Students are encouraged to arrange their own still life and are shown how to create a more dynamic drawing using the Line Draw Build tools in Keynote to make an animation of their finished artwork. Learning how to draw using a vanishing point was a revelation to me at school. This made any drawings of houses, buildings or rooms look so much better than my previous attempts. The iBook clearly demonstrates perspective and shows students how to apply it in their own drawings. As part of a fully integrated real-world activity, they can draw up plans for their dream house, then move over to a spreadsheet activity on spending budgets to decorate their room and carry out a web search activity to get the best price for the furniture. Using the sketchbook element of the Sketches School app pupils are encouraged to design a range of logos, thinking about their target audience and how to use shapes and colours to convey emotion. This can easily be linked to a literacy activity or poster designs for an after-school club etc. Using a design brief they plan their ideas, using clip art and other graphical sources to realise their designs. We are surrounded by infographics and posters that impart information to us. Here students learn about the various elements that make for a good infographic. By gathering facts (research) making a sketch note (mind map) and gathering data (spreadsheet or bar chart maybe) they can then think about how to organise and simplify the data to tell a story that engages the viewer. Everyone loves book illustrations, just by visiting the school library you can compare and contrast different styles such as Dahl and Walliams. Students pick a scene from their favourite book and using the drawing tools in Keynote, plan a storyboard and create illustrations. They can then import the illustrations into the book templates in Pages, which they can share via iBooks, and a fully illustrated story has been created. Now if that doesn’t bring your art and literacy teaching to life, nothing will! Have you ever wanted to deliver an outstanding music tech lesson? If the answer is yes, then ‘Everyone Can Create Music’ is for you! This is your chance to push your teaching boundaries and embrace some exciting new ideas and ways of working (and put the Music Co-ordinator to shame). GarageBand provides your pupils with a fully functioning music studio with a plethora of sounds that they can use to create their own music. This doesn’t prevent them from using real instruments too, as they can be recorded by using the built-in microphone on the iPad and simply tapping the screen. This makes for endless possibilities. You and your class can go on a musical journey, learning how to use GarageBand, with tips and techniques from Justin Timberlake and producing your own music. Just watching the video introduction is a great start as you have a superstar engaging with your class explaining how they can create music. Students are taken through a range of activities including modifying the tempo of a song, arranging loops using a Live Loops template to build and record music as well as personalising a template by adding their own loops. This is a great introduction to music for everyone as it gives instant success. The purist might argue it’s not music (but it actually is!). Creating music with Live Loops is about giving access and inspiration to “Everyone”. Students edit cells, add effects to a song and recognise different song sections all while remixing Justin Timberlake’s “Can’t stop this feeling”. This introduces pupils to technical vocabulary within songwriting and GarageBand allows them to explore all of these elements in an engaging way using “real world” examples and techniques. Understanding basic chord structure and progression enables students to create music. They see how to layer several instruments together to compose a song. Using Touch Instruments they can perform and record and then use quantisation to correct their timing. Being able to play chords accurately and with ease builds confidence which in turn inspires students (and teachers) to experiment and be creative. Justin Timberlake guides students through how to write lyrics. Students brainstorm and develop song ideas using Pages and identify rhyming patterns (linked to literacy) to build the lyrics. Students write their own verse for “Can’t Stop This Feeling” and record it, adding vocal effects. What a great cross curricula activity this is, writing and recording with a purpose. Students are taught how to mix the levels of a song and add effects to make it sound professional just like a recording studio engineer. This adds another level of creativity as working on their own song brings a higher level of pride in their work. Prior to GarageBand on the iPad this would have been an “A Level” music activity, now we are teaching the musicians of the future. After exporting the track it can be used in a video or slideshow project. This replicates real-world scenarios that will bring your curriculum to life. We are surrounded by video and by developing a greater understanding of it, students can use it to express themselves more creatively. A wide range of genres are explored, which naturally lend themselves to other areas of the curriculum. You can see from the list of topics below that a wide range of styles and ideas are going to be covered. I would suggest choosing one section, making that the focus of your video and linking it directly to another subject to enrich the way pupils learn. Students explore how the camera works and how to piece together a short video presentation. Using Clips makes for an exciting and easy introduction for your class. Students trim and arrange clips, add posters, stickers, emoji and photos, use filters and music to enhance mood - now they’re making videos. This activity links directly to Literacy in terms of writing a script and presenting ideas. Silent movies as a genre serve as a great vehicle to develop skills that can be lost when the dialogue says it all. Linking this to story writing, drama or technology produces a fantastic project. Learning how to frame a perfect shot, capturing multiple shot types and using a grid in the camera app to guide shot composition will provide great outcomes. Using a black and white filter can set the movie in a bygone age. Using a variety of fill-in, drawing and animation techniques, students are led through a series of activities which culminate in them making their own movie pitch. They’ll edit a trailer in iMovie, create storyboards to pre-visualise a scene and animate drawings and objects. This could easily be linked to their creative writing topic and would allow them to explore ways to share their ideas. Instruction writing just went to another level. We’ve all looked for a YouTube clip to help with some domestic crisis, now students can make their own! This starts with script-writing and rehearsing, followed by choosing camera angles and setting up a teleprompter to create a professional looking tutorial. Students use Clips to gather footage and then transfer their video to iMovie, where they split clips and fix ‘jump cuts’ with B-roll by adding and adjusting inserts and cutaways. We all love a good documentary, Blue Planet to name but one, so why not get your students to make one? Every topic they learn about at school can lend itself to making a documentary like the Time Team. Students get the chance to develop the skills required to do just that. They’ll experiment with interview techniques, the right camera position, getting the set ready, and creating the killer questions to ask. They’ll use manual controls to change focus and exposure, create a split screen and picture-in-picture overlay effects, as well as add transition effects and lower third titles. All of these skills feed directly into all aspects of the curriculum. Why not spice it up a little? Once the students have a range of skills under their belts, they should be ready to film a live event. This could range from an assembly, to a sporting event, to a guest speaker visiting the school. Students record a time-lapse shot in Camera, use freeze frame and slow motion in iMovie and add motion to photos. It’s as simple as planning what you need to do, filming it and editing it. As a conclusion to the iBook, and a way of combining all that’s been learned so far, we move on to making a short film. In my experience of making films with my class, short is the operative word. Big plans can often be unachievable. You’ll be lead through writing a script, planning each scene, organising the set and filming the best shots. Then looking in more depth at audio and sound effects, all culminating in your students' first film. If you have ever wanted to take great photographs then this iBook is the one for you. Becoming part of the Paparazzi or wanting to improve the quality of work produced by your class, half a term on the Art of Photography could be the way to go. Millions of photographs are taken every day from advertising to the selfie. By learning some basic skills and techniques, we can open up the doorway to creativity and allow pupils to communicate their ideas, and emotions, through the power of the still image. The iBook takes pupils from beginner to expert photographers. It provides teachers with an easy to follow scheme of work that will slot right into any Art lessons that you have planned. As you can see from the variety of section headings, it will keep everyone engaged and learn more about photography. We start with the basics of using the features of the Camera app and begin to consider the composition of shots. Students are encouraged to think about what they see and how to frame the image to get the best results. They have to think about lighting conditions, how to straighten, rotate and crop and consider adjusting focus and exposure before taking a photo. They also explore making graphic additions to photographs to personify them. Not that everything revolves around the selfie but, this chapter will show some techniques and considerations to achieve better portrait shots. Recreating famous photographs, or scenes from history, make linking this activity to the curriculum easy. The students explore backlight and silhouettes, how to apply filters and use markup to retouch photos. The Victorian-style silhouette images spring to mind. This chapter fits perfectly with school trips, especially when students visit outdoor-centres. Using the rule of thirds, students capture the perfect landscape image which they could then include in a slide show presentation on their return to school. The Panorama setting also opens up new avenues of creativity, as well as learning how to apply filters to establish mood. Linking photography to literacy, by using a photograph as the starting point for writing, will integrate the use of technology within your curriculum. Capturing a good action shot is a challenge but, when you know the techniques this becomes so much easier. As teachers, we can’t be expected to know everything about photography but, the book does and leads us through each stage in small steps. From using burst mode to long exposure effects, as well as animating photo’s to bring them to life. This is one of my favourite sections, as it combines photography with collage-skills. Students capture a range of images, build compositions with multiple layers and learn how to use Instant Alpha to mask their photos. The new drawing tools in Keynote allow students to add their own twist to existing images, making them their own. This will bring an “All about me” project to life. Telling a story with a series of images is a great way to use the camera and, adding the right pictures to a persuasive text, can add depth to arguments. Students are encouraged to create a slideshow using images, text and transitions, which they can then export as a movie for the class blog, inspiring even the most reluctant of writers. We all want to share our best work but, how do we go about publishing it? Students have the opportunity to create an ePub portfolio book and publish it via Keynote. Before doing that, they’ll also use the drawing tools in Pages to personalise their work. We can easily link photographs to other areas of teaching and the impact often cross-pollinates other subjects.